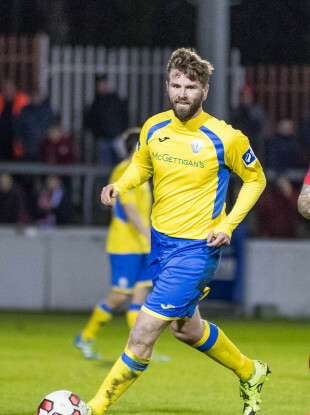 Finn Harps forward Paddy McCourt scored for the Donegal club on Saturday. THE FINAL ROUND of games in the SSE Airtricity League First Division came together on Saturday night, with Finn Harps, Shelbourne and Drogheda United completing the highly-contested play-off places. The Reds and Drogs will face now off against one another in a two-legged play-off, with the winner facing Harps to see who gets the chance to battle for promotion to the Premier Division — the promotion/relegation likely to be against Limerick FC, who currently occupy ninth spot. Longford Town had an outside chance at filling the remaining play-off position before kick-off on Saturday, but even a brilliant second-half rally from Neale Fenn’s men against champions UCD was not enough. Collie O’Neill’s Students were crowned champions exactly one week ago and roared into a 2-0 lead at City Calling Stadium courtesy of goals from Daire O’Connor and Yousef Mahdy. A second-half double from Dean Dillon earned Longford a point, but it ultimately left them four points adrift of fourth place thanks to Drogheda’s 2-0 victory away to Cobh Ramblers. Stephen Henderson’s side have forged an unforgettable campaign for Cobh supporters, stunning Dundalk to make it all the way into the club’s first ever domestic cup final. Last weekend’s EA Sports Cup showpiece saw Derry City take the silverware and the Cork side suffered another defeat on Saturday, with a Sean Brennan penalty added to by a second-half strike from Luke Gallagher. Shelbourne are vying for a return to top-flight football for the first time since 2014 and secured their place in the play-offs via a 3-0 victory at home to Galway United. A point would have been sufficient for Owen Heary’s men, however an early goal from James English after just four minutes set his side on the way to a commanding victory — Greg Moorehouse and Reece McEnteer adding two more after half-time. Finn Harps were assured of second spot already heading into Saturday’s final round of fixtures. Ollie Horgan’s men are looking to bounce back into the Premier Division immediately following last season’s relegation and will now take on the winners of Shelbourne and Drogheda. His side saw out their final league fixture in style, hammering Cabinteely 7-1 at Finn Park. Michael Place netted a brace, while there were also goals for former Celtic ace Paddy McCourt, Jesse Devers, Aidan Friel, Nathan Boyle and Jacob Borg. Email “Paddy McCourt scores during 7-1 win as Harps, Shelbourne and Drogheda wrap up First Division play-off spots”. Feedback on “Paddy McCourt scores during 7-1 win as Harps, Shelbourne and Drogheda wrap up First Division play-off spots”.